Book Signing with Kathy Garver and her X Child Stars co-author Fred Ascher! Kathy records a new book for Oasis Publishing on March 19 and 20 Look for it out soon! Kathy is teaching several acting classes in the San Francisco area through the award-winning lessons.com and Voices inc.
Sign up and learn from Kathy herself! Sunday, June 11, 2017, 10am to 5pm, So. San Francisco Conference Center. Paul Lisnek and General manager James Jensen of Porchlight Theatre and Kathy opening night of In the Heights Wonderful musical by Lin-Manuel Miranda who created and was the star of the Broadway hit Hamilton In The Heights has now receivedgreat reviews and a standing ovation that night! Kathy received the commemorative pictorial postmark with her photo and that of Charlton Heston's photo. Come join Paul Petersen and Kathy at the a wonderful retro radio convention next weekend. They will be appearing live on stage presenting radio recreations at the Great Lakes Nostalgia Convention April 7-9 at the Radisson in Kalamazoo Michigan The shows consist of Mr and Mrs. North, Life of Reilly and Gunsmoke - great classic shows which got their beginning on radio before they segued to TV. See you there! Spider friends...GO FOR IT! heating things up in the Lair this week is the amazingly talented actress who brought Firestar to life on Spider-Man and His Amazing Friends Kathy Garver! Kathy Cast as Dorothea Mae Clements in the new television western series Big Sky. Kathy is a guest at the exciting Smallville Comic Con to be held in, you guessed it Smallville Kansas, home of Superman. It is actually Hutchinson, Kansas but the name was changed for the weekend to protect the innocent. Join Kathy and other guests as they participate in panels sign autographs and have a rousing good time with cos play and games! Kathy wins the trivia contest at the Nostalgia Expo with her Very smart team! Kathy sings the farewell song with Don Ranbow the director and Michael Helms actor and producer. Kathy is interviewed by Shiela Gray on Channel 12, WKRC in Cincinnati to promote her new book Surviving Cissy. Kathy also visits Fox 19 in Cincinnati and is interviewed by new father Frank Marzullo to promote Surviving Cissy and the Nostalgia Expo. Kathy appears on You and Me this Morning in Chicago interviewed by the sterling hosts Jeanne Sparrow and Melissa Forman. Kathy returns to the Windy City via the air waves for an in depth radio interview with the erudite and witty Ken Sevara on his show Fly by Night. I will be on the air with "Professor of Trivia" and award winning personality Morgan White Jr. on WBZ NewsRadio 1030 in Boston tonight (Friday) just after midnight Eastern/9:00 p.m. Pacific. If you are in the Northeast, please tune in, or listen online from anywhere at http://boston.cbslocal.com/station/wbz-news-radio/. If you want to call in with a question, the studio number is 617-254-1030 OR 888-WBZ-1030. For more info visit Morgan’s website at http://www.triviamorganwhitejr.com/. I'll be having a martini Thursday afternoon. MIKE Martini, that is. That's right-- I will be on the Mike Martini Show on Cincinnati's WMKV 89.3 FM at 4:00 p.m. Eastern time, chatting about Cincinnati Nostalgia Expo coming up on Friday and Saturday. You can listen online at wmkvfm.org! Kathy presents a Broadcast Award to the Kellogg creatives for their now iconic creation of iconic Snap Crackle and Pop characters at the Museum of Broadcast Communications in Chicago 5-10pm in The Paul Lisnek Gallery, Paul, A friend of Kathy's will display one of the pieces of jewelry from Family Affair she donated to him for his gallery in the museum. Kathy with Paul Morris the Cat who also received an award that night. Kathy shows off her Family Affair memorabilia hung in The Paul Lisnek gallery wing of the Museum of Broadcast Communications in Chicago. The new network Decades plays host to Kathy as Kelli interviews her about the culture of the 60's and the significance Family Affair played in reflecting the social mores of that time. Kathy is speaker and guest at SFA - Special Forces Association in Concord California. What a pleasure a to meet the Green Berets and Seals who bravely defend our country! Broadway World. "Tom Sawyer Musical RIVER SONG Will Premiere at Niswonger Performing Arts Center". Read more. 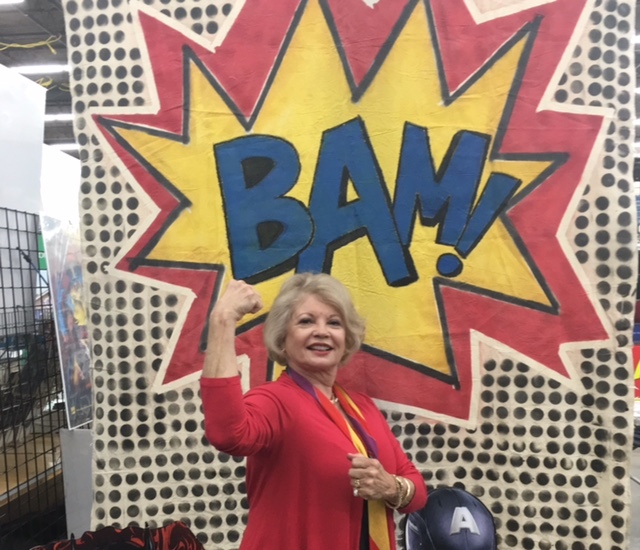 "Kathy Garver: From Cissy to Spiderman–Still Going Strong in a Dynamic Career that Sizzles!". Read more. Kathy gives a fun interview about her new stage musical River Song - The Adventures of Tom Sawyer, her new book and her classic TV series Family Affair on Friday January 20. Tune in or follow on the web for a little joy in your day. Taylor Trade Publishing an imprint of Rowman & Littlefield; lands a two book deal with entertainment dynamo Kathy Garver. Read more. Kathy tapes a radio interview for the Mom and Pop Shop internet show with George Bettinger as host. Jennifer Hugus interviews Kathy for LA Beat magazine; watch for release date! Kathy is a guest at Courts Celebrities in Hollywood appearing on behalf of the charity A Minor Consideration to benefit young actors. A new service - Foodie Taste Kitchen - has emerged in Napa valley and Kathy has been tapped to do the promos. Here she is shown with co-creators Drew Brewer and Abigail O'Connor. Kathy is a special guest at Brigham Young University, speaking to the Theatre Arts Graduate students and touring the beautiful campus and archives of Cecil B. DeMille - director of one of her first movies - The Ten Commandments. At the LDS studio with Scott Boyter, Kathy's host at BYU and Peter Czerny.